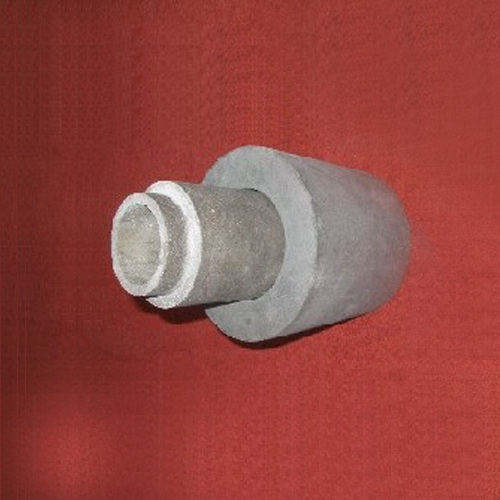 Capital Refractories' patented Unibore nozzle system has been developed and introduced to complement Multicast - the proven reusable stopper system. This unique two component system consists of a re-usable outer nozzle and a second inner nozzle, which is available with a range of bore diameters; a fibre gasket makes the seal between the two pieces. This offers a new method of changing the diameter of the nozzles after each cast by replacing the inner part of the nozzle only. Unibore's unique two-piece nozzle is fundamentally different to conventional one-piece nozzles. There are two major differences. The first is that there is a much larger opening of the outer section of the nozzle compared to a standard nozzle. The second difference is the tapered design of the inner nozzle, which is available with a range of bore diameters. Nozzles are quickly and easily changed with the operative working from the outside of the ladle away from the effects of heat. During the process, the one-piece stopper remains in place and does not need resetting. 1、Reduced consumable costs: notably stoppers, nozzles and filters. 2、Quicker, more stable and controllable metal flow. 3、Potential to improve the quality of the casting. 5、The flexibility of selecting the correct bore diameter for the planned castings. 8、Reduced labour costs from set up of ladle and stoppers. In addition to the nozzle diameter flexibility, there are potential technical benefits in converting to the system. The large opening of the outer section reduces drag from the stopper and nozzle reducing flow rate fall off. Customer tests have also shown that mould washing is reduced, probably due to a reduction in vortexing from the tapered design of the inner nozzle. This can result in an improvement in quality and a reduction in rework of castings. Due to the reduced drag of metal through Unibore, metal flow rates are higher than with conventional nozzles. Thus in order to achieve similar flow rates, a smaller diameter Unibore nozzle is usually employed. This is shown in the figure on the right which was compiled from exhaustive comparative trials carried out at a major UK foundry. Unibore is available with a wide range of bore sizes from 25 to 100 mm. Unibore has been trialled and adopted by many steel foundries in the UK and overseas with great success: reducing defects and improving the scrap rate. All the companies have reported improvements in efficiency with cost-effective operation. Ladle inventories have been reduced, optimising ladle operatives' time and offering flexibility that has not been available before. The Unibore system can also be successfully used in non-ferrous applications. Unibore is ideal for auto pour furnace systems allowing more flexibility to the methoding process. All this combined with the potential to improve casting quality and reduced rework, offers a unique opportunity to reduce operating costs in your foundry.